This sturdy and dependable unit is effective for testing audio circuits and speaker systems. 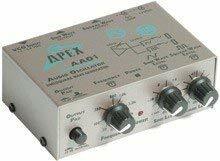 The AAO1 Test Oscillator provides a steady-state sine wave and/or square wave at the frequency of your choice. Ideally used in conjunction with other appropriate measuring devices - voltmeter, VU meter, etc., the AAO1 is suitable for testing and measuring all types of audio circuits or checking the calibration of crossovers. Tunable from 20 Hz to 20 kHz and variable in gain over a wide range thanks to independent sine and square wave level controls plus an overall -10dB output pad. The VCO input lets you connect an external source of DC control voltage (perhaps a computer or keyboard instrument) to vary the AA01's oscillator frequency. Used along with a flat-response measurement microphone and VU or other level meter, it is also effective in providing test signals when you are measuring the frequency response of speaker systems.